﻿ Heroes of the Soviet Union at Stalingrad. The total number of persons who were awarded this title is 12,745 (twenty people have been stripped of this title due to various circumstances). The great majority of them received it during World War II (11,635 Heroes of the Soviet Union, 101 twice Heroes, 3 three time Heroes, and 2 four-time Heroes). Sixty-five people were awarded the title for actions related to the First Afghan War, which lasted from 1979 until 1989. 2 101 people were to receive the award twice. A second award entitled the recipient to have a bronze bust of his/her likeness with a commemorative inscription erected in his home town.Two famous Soviet fighter pilots, Aleksandr Pokryshkin and Ivan Kozhedub were three Heroes of the Soviet Union. A third award entitled the recipient to have his/her bronze bust erected on a columnar pedestal in Moscow, near the Palace of the Soviets, but the Palace was never built.After his release from serving a 20-year sentence in a Mexican prison for the assassination of Leon Trotsky, Ramon Mercader moved to the Soviet Union in 1961 and was awarded the Hero of the Soviet Union medal from the then head of the KGB Alexander Shelepin.The only individuals to receive the title four times were Marshal Georgy Zhukov and Leonid Brezhnev. The original statute of the Hero of the Soviet Union, however, did not provide for a fourth title; its provisions allowed for a maximum of three awards regardless of later deeds. Both Zhukov and Brezhnev received their fourth titles under controversial circumstances contrary to the statute, which remained largely unchanged until the award was abolished in 1991. Zhukov was awarded a fourth time "for his large accomplishments" on the occasion of his 60th birthday on December 1, 1956. There is some speculation that Zhukov's fourth Hero medal was for his participation in the arrest of Beria in 1953, but this was not entered in the records. Brezhnev's four awards further eroded the prestige of the award because they were birthday gifts, on the occasions of his 60th, 70th, 72nd and 75th birthdays. Such practices halted in 1988 due to a decision of the Supreme Soviet of the USSR, which formally ended it. By the 1970s, the award had been somewhat devalued. Important political and military persons had been awarded on the occasions of their anniversaries rather than for any immediate heroic activity. All Soviet cosmonauts, starting from Yuri Gagarin, as well as foreign citizens who participated in Soviet cosmic program as cosmonauts, received Hero award for each flight (but no more than twice). Apart from individuals, the title was also awarded to twelve cities (Hero City) as well as the fortress of Brest (Hero-Fortress) for collective heroism during the War. The last recipient of the title "Hero of the Soviet Union" was a Soviet diver, Captain of the 3rd rank Leonid Mikhailovich Solodkov on December 24, 1991 for fulfillment of a special diving task. Following the collapse of the Soviet Union, this title was succeeded in Russia by the title "Hero of the Russian Federation", in Ukraine by "Hero of Ukraine" and in Belarus by "Hero of Belarus". Azerbaijan's successor order is that of National Hero of Azerbaijan and Armenia's own hero medal is that of National Hero of Armenia, both modeled on the Soviet one. The award was established on April 16, 1934, by the Central Executive Committee of the Soviet Union. The first recipients of the title originally received only the Order of Lenin, the highest Soviet award, along with certificate (грамота, gramota) describing the heroic deed from the Presidium of the Supreme Soviet of the USSR. 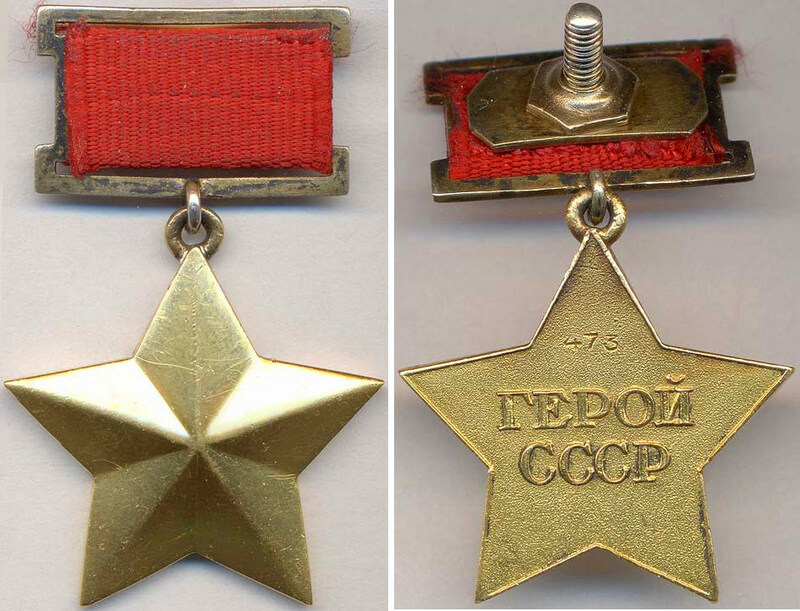 Because the Order of Lenin could be awarded for deeds not qualifying for the title of hero, and to distinguish heroes from other Order of Lenin holders, the Gold Star medal was introduced on August 1, 1939. Earlier heroes were retroactively eligible for these items. A hero could be awarded the title again for a subsequent heroic feat with an additional Gold Star medal and certificate. An additional Order of Lenin was not given until 1973. The practice of awarding the title multiple times was abolished by the Supreme Soviet of the USSR in 1988 during perestroika. Many foreign citizens were awarded the title. The title was also given posthumously, though often without the actual Gold Star medal given. The title could be revoked only by the Presidium of the Supreme Soviet. Heroes of the Soviet Union at Stalingrad. Tank commander KV, 1st Tank Battalion, 133rd Tank Brigade. HEROES OF THE RUSSIAN FEDERATION AT STALINGRAD. 1) Sergeant Feodosy Ganus - June 19 1996 Charging of tank KV, 344th Tank Battalion, 91st Tank Brigade.